Online applications are invited from the eligible candidates for the mentioned posts through only the official website(See URL Below). 1. Laboratory Technical(Blood Bank): Five Laboratory Technical in Blood Bank (UR=2,SC=2,ST=1). Remuneration for the said post is Rs. 17220/- per month consolidated. Place of posting in Garden Reach SGH-2, Baruipur SDH-1, MRBH-2. The upper age limit for this post is 40 years as on 31.07.2017. 2. 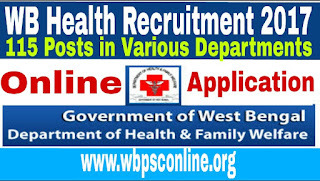 Technical Supervisor(Blood Bank): Four Technical Supervisor in Blood Bank(UR=2, SC=1, ST=1). Remuneration for the above post is Rs. 17220/- per month. Place of posting in Garden Reach SGH, Canning SDH, Baruipur SDH, MRBH. The upper age limit for this post is 40 years as on 31.07.2017. 3. Counselor Blood Bank: One Counselor in Blood Bank(ST=1) under District Health & Family Welfare Samity South 24 Pargana. Remuneration for the said post is Rs. 13200/- per month consolidated pay. Place of posting in Garden Reach SGH. The upper age limit for this post is 40 years as on 31.07.2017. 4. ICTC Laboratory Technician: Fifteen ICTC Laboratory Technician(UR=8, SC=3, ST=1, OBC-A=2, OBC-B=1). Remuneration for the above post is Rs. 13000/- per month. Place of posting in Different Blocks under South 24 Parganas. The upper age limit for the said post is 60 years as on 31.07.2017. 5. ICTC Counselor: One ICTC Counselor(UR=1). Remuneration for the said post is Rs. 13000/- per month. Place of posting in Bhangore-1. The upper age limit for this post is 60 years as on 31.07.2017. 6. Counselor(STI): One Counselor(STI) (UR=1). Remuneration for the said post is Rs. 13000/- per month. Place of posting in Baruipur SDH. The upper age limit for this post is 60 years as on 31.07.2017. 7. Kala-Azar Technical Supervisor(KTS): Three Kala-Azar Technical Supervisor(KTS). The maximum remuneration for this post is Rs. 10500/- per month consolidated. Place of posting in BPHC- Baruipur, Canning & Kultali. The minimum age 50 years and the upper age limit is 60 years as on 31.07.2017. 8. Staff Nurse-ARTC: One Stuff Nurse-ARTC(UR=1). Remuneration for the said post is Rs. 13000/- per month. Place of posting in ARTC- MRB Hospital. The upper age limit for this post is 60 years as on 31.07.2017. 9. Medical Officer(MO-DTC) RNTCP: One Medical Officer(MO-DTC) RNTCP. Remuneration for this post is Rs. 40000/- per month. Place of posting in South 24 Pargana DTC. Age between 22 years to 62 years as on 31.07.2017. 10. RNTCP Lab Technician/Sputum Microscopist: Four RNTCP Lab Technician/Sputum Microscopist(UR=3, SC=1). Remuneration for the said post is Rs. 16860/- per month or as per CTD Guideline. Place of posting in BPHCs under South 24 Parganas. Age between 22 years to 62 years as on 31.07.2017. Application Fees: Application fees of Rs. 100/- for other than reserved category candidates(Rs. 50/- for reserved category candidates) are to be deposited in the form of Demand Draft issued from any Nationalised Bank in favour of “District Health & Family Welfare Samity South 24 Parganas” payable at service Branch, Kolkata. 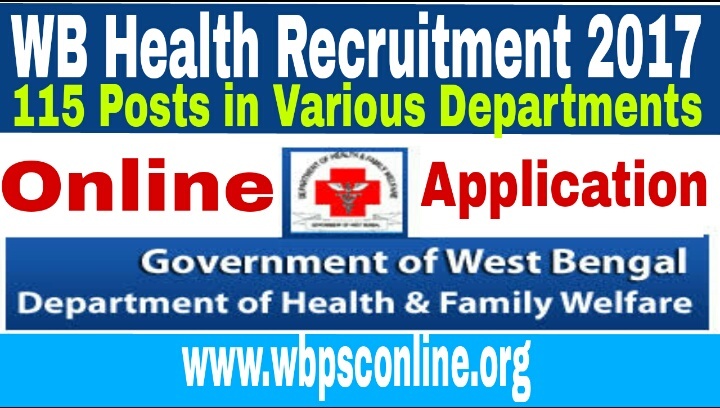 Interested and eligible candidates may apply online the above mentioned posts under “WB Health Recruitment” through the official website at www.wbhealth.gov.in. Date of Commencing online application is 16.08.2017 and last date for submission of online application is 05.09.2017.